But I love it even more when I look through the pages and can say "Hey, I know them!" 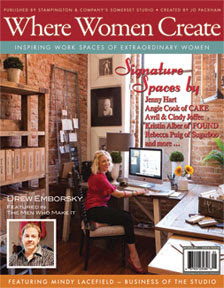 The Winter issue of Where Women Create features three very talented local Arizona ladies. First, owner of my favorite store - Kristin Alber of FOUND. Kristen and her husband renovated a beautiful old brick building in downtown Mesa that house not only some of the funnest places to shop, but all three of the Arizona ladies featured in the magazine. Last year when Paula and I taught the Advent Calendar class to a few ladies in at my home we decided to also have a little field trip the day before the class and visit some of our favorite shops. Of course our tour included FOUND, and while we were there we ran into Allison Tyler Jones who's photography studio is just across the hall from FOUND. Allison and I go WAY back. We worked on several books together in our "Designing With...." book series days. She is an extremely talented photographer and her studio is definitely a great choice to feature. Check out her studio.....such an inspiring place! Love the rolling doors to the offices...and her photography displays are divine! After Allison showed our group around her studio she also offered to take us upstairs to her sister, Caroline Tyler Decesare's interior design studio. Here are a few pictures I took while we were there. Loved this inspiration/photo board as you walk into the studio....also the lamps made from giant C-clamps! Bins for holding samples, etc. Thanks ladies for sharing your creative spaces! 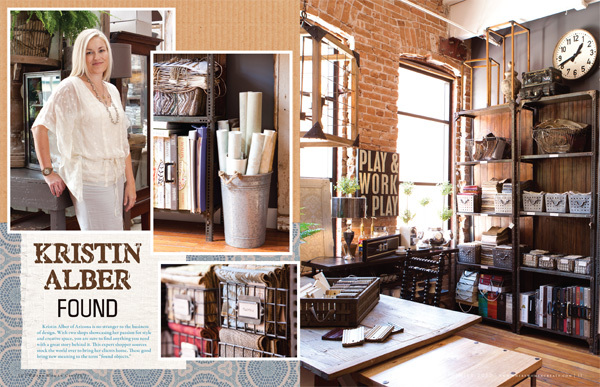 I just bought that issue this weekend and was drooling over the creative spaces! Allison and Kristen have gorgeous studios...thanks for sharing your pics. I could live there, it's gorgeous! You always find the neatest places to show us. Thanks. [I think I remember a previous post mentioning you like to watch The Closer. Hope you noticed it just came back on! Love it.